This book is not for the religious person. 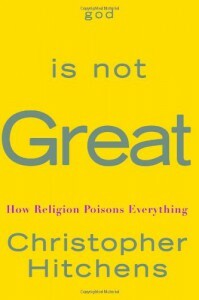 Hitchens, one of my favorite authors, so far has set very good points on how religion poisons everything. His religion disbelief was not caused by a traumatising event. He goes into further detail how religion has slowed civilization's progress and how it is a major contributor to many wars. One of those wars is the one on terrorism and how a people with a deep religious view could kill thousands in the 9/11 attacks.